Fisherman Island National Wildlife Refuge is a barrier island on Virginia’s Eastern Shore, surrounded by the Chesapeake Bay and the Atlantic Ocean. Normally its gates are closed and beaches are not accessible to the public, for the protection of the natural habitats of its animals, including various birds and sea life. I was fortunate to represent the Surfrider Foundation, Virginia Beach Chapter for a beach cleanup at the refuge, along with about 30-40 other volunteers from Lynnhaven Dive Center and a couple of park rangers. 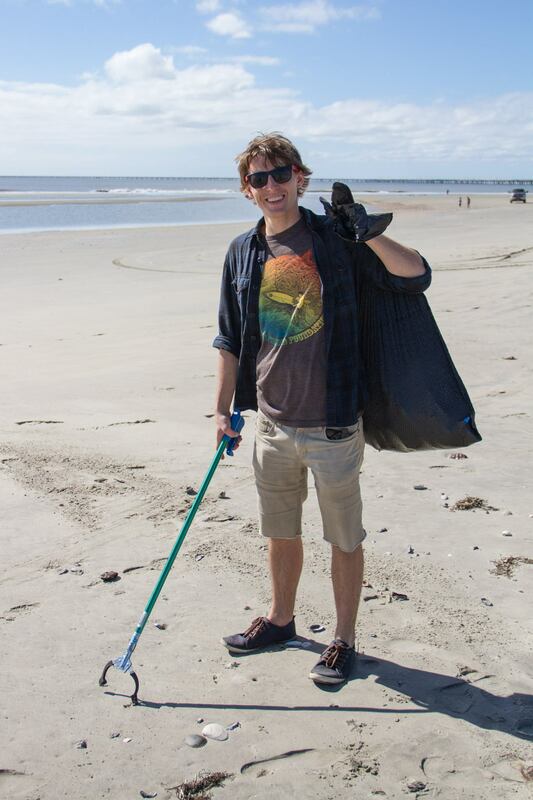 The beach was in some serious need of a cleanup, especially after Hurricane Matthew scattered debris and caused damage to the island habitats. Cutting over on a trail through the forest full of sumac, holly, and other vegetation, we discovered some World War II relics hidden beneath the trees. 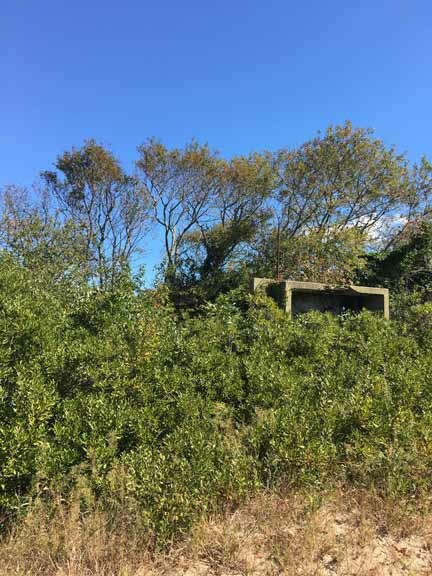 There’s an abandoned bunker and lookout tower on the dunes, this used to be a military fort that pre-dates the Chesapeake Bay Bridge Tunnel. More beaches in our area would resemble the wildlife refuge if it weren’t for development, so you can imagine when you’re standing there on the beach that this is how it would naturally be in the wild. I certainly felt as those I was close to nature, with little other human interference found at the refuge. With this you’ll take in some sights and smells that you wouldn’t typically find elsewhere when doing a beach cleanup. 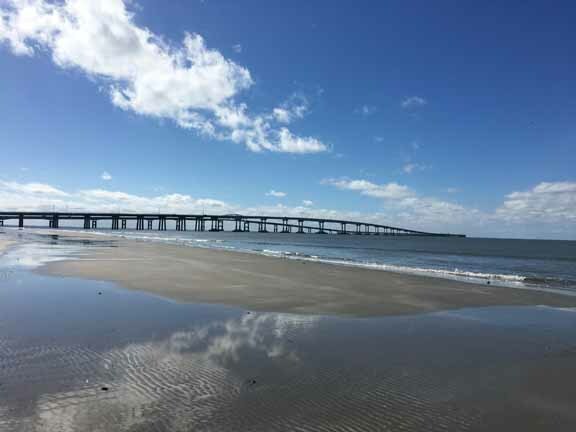 Cigarette butts and plastic bottles still find there way to the shore, but horseshoe crab molts were riddled across the sand, a volunteer said they found a whale vertebrae, little children lending a hand found a starfish, and a lone sea turtle skull sat out in the sun, possibly for several ages. Large fishing nets are submerged in the dunes, buoys from damaged boats were carried to the island, Christmas ornaments of all things were found, and part of an air conditioning unit was dug up. Personally I found a plastic tire part and all of the rest of its bits, not far from a retro Pepsi Cola can that looked like it dated back at least a couple decades. Approximately 50 garbage bags of litter were filled during the afternoon cleanup. It is a serene island where the life of its inhabitants seem to thrive, hand-in-hand with the help of park rangers and volunteers. Flocks of birds shot over us, deer came right out to cross paths, and we met an injured peregrine falcon that was being attended to by a bird handler. She was transporting the bird to a rehabilitation center, it was having trouble flying, injured perhaps by the storm. Working together to clean up the area and respect the homes of wildlife was ideal to how things should and could be. While we were thanked by the park rangers for our efforts to keep the beach clean, the privilege was all ours, being able to set foot in Fisherman Island refuge and take it all in.